It seems that Groezrock is putting on extra attention to details to make up for the absence of this year and is turnign the 2019 edition to a whole new level. Having already announced the Friday & Saturday headliners and some very strong names already, the festival has revealed a bunch of new names. The lineup now includes Marky Ramone & Greg Hetson, No Warning, Backtrack, Counterparts, Emmure, Joyce Manor, The Word Alive, The Rumjacks, Teenage Bottlerocket, Can't Swim and many more. Each announcement becomes more and more tempting, don't you think? Which bands are you excited to see? 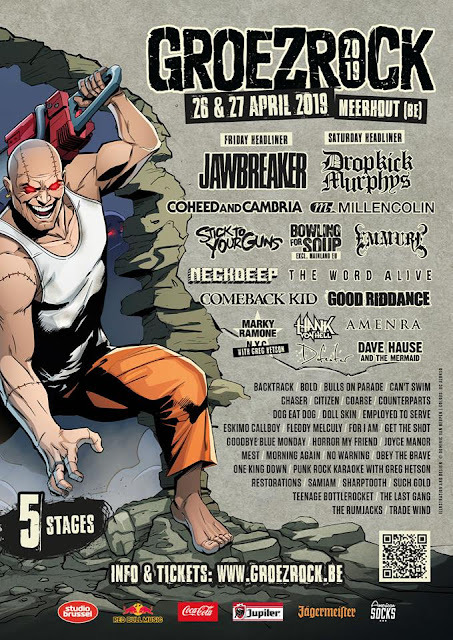 Groezrock is taking place in Meerhout, Belgium on 26-27 April 2019. For info and tickets, visit www.groezrock.be.